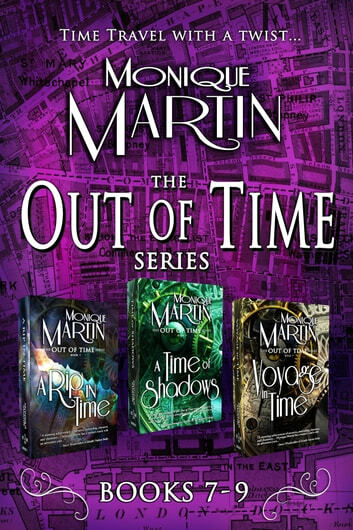 This set contains 3 full-length novels (books 7-9) from the Out of Time series. 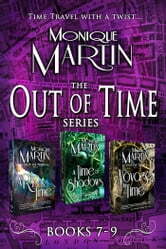 The Crosses are back in book 7 of the Out of Time Series. An old enemy returns threatening to destroy not just Simon and Elizabeth but the timeline itself. To keep that from happening, they travel back to 1888 London to find Jack the Ripper…and save his life. If he dies, the timeline changes, everything they know and their lives together, will be lost. But they soon discover the only thing harder than saving a monster is finding him. It's been a few months since Simon and Elizabeth returned from their adventure in 1888 London. Jack is back with them and all is as it should be, until a knock on the door changes that. A visitor from the future turns their world upside-down. Unable to return her to her time, they go to the Council for help, only to discover there are bigger problems afoot. All of the watches have been shut down until a dangerous and secret weapon--a watch that can change any point in time--can be found. Too powerful for anyone to possess, it was hidden. But now the secret's out, and the mysterious Shadow Council will do anything to get their hands on it. Simon, Elizabeth and Jack race to find it before the Shadow Council does or it will be the end of...everything. Keeping Bohr alive is hard enough, but when he books passage on the Titanic, their task might just be impossible. Forced to follow him onto the ship, they must face mysterious assassins, dangers at every turn and survive one of the most infamous disasters in history. Fabulous series, that keeps you on your toes the whole time. As Simon and Elizabeth face their adventures in time, you are right there with them, trying to help figure out the puzzles needed to get them out of the trouble that always finds them. Very good reads! These stories leave you begging for more! I have read all 10 books of the series so far. Even though you can predict the outcome with some certainty it is still enjoyable to read and see how close you actually are. I couldn't put it down. I even cried. I am a true fan! I wish the CW or SciFi Channel would make these books in to a TV Series already! These books kept me spellbound. I couldn't put them down. Worth reading.